ABSTRACT: During the first two years of the Xi administration, a series of successive measures were taken to restructure the way that the Chinese Internet is governed. New institutions were created to centralise governance over a sphere that had hitherto been fragmented, while the pursuit of ideological and technological security led to greater efforts to control the circulation of online information and prevent harm, particularly originating from foreign threats. 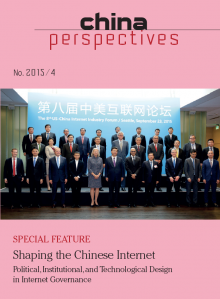 This paper analyses this process, and discusses implications for the future of the Chinese and global Internet. KEYWORDS: Internet governance, political reform, media, security, ideology. ABSTRACT: Drawing upon policy analysis and textual analysis of official microblogs, this paper describes how Xi’s new leadership regulates public opinion and public emotion in Chinese microblogs. The paper argues that the advent of the Xi Jinping administration demonstrates much more aggressive ideological demands. On the one hand, the new leadership has increasingly ramped up its efforts on censoring information and repressing critical public opinion. On the other hand, however, it has paid more attention to proactively guiding public opinion on the Internet. New strategies, represented by cultivating self-discipline among Internet users, repressing the insubordinate and wooing obedient public opinion leaders, establishing cooperation between official microblogs, and eliminating emotional outpourings in the microblogsphere have been used in Xi’s new ideological campaign to repress Internet rumours and sanitise critical public discourse. KEYWORDS: Internet policy, Xi’s leadership, censorship, guiding public opinion and emotion, Chinese microblog. ABSTRACT: This article aims at documenting the implementation of the Domain Name System in China, in coordination and in tension with the global Domain Name System since the end of the 1980s with the Chinese country-code top-level domain “.cn,” and more recently with the creation of Chinese-language domain names such as “.中国” and “.中文网.” It puts into perspective the notion of “digital sovereignty” by analysing the role of the DNS in the “localisation” of online content as part of the censorship system. It further shows that although Chinese representatives have always been very critical of the existing architecture and management of the DNS on the global stage, their attitude has evolved from de facto, bottom-up participation and protection of their interests to a more confident and assertive behaviour, as the growth of the Chinese Internet has put them in a more dominant position. KEYWORDS: China, Internet, Domain name system, CNNIC, ICANN, digital sovereignty, localisation, Great Firewall. ABSTRACT: China’s Internet development raises questions on the interplay of user autonomy and Internet governance in the larger Chinese-language online cultural sphere. To what extent has user autonomy been established to conduct information gatekeeping collaboratively online? To examine how the power of Chinese-language Internet users has been harnessed in relation to the filtering and censorship regime, the article applies the concept of “network gatekeeping” to analyse two major user-generated websites, Chinese Wikipedia and Baidu Baike, as different examples of collaborative filtering projects. Effectively they share “word-of-mouth” recommendations on encyclopaedic knowledge and information by user-contributors to edit content from different parts of the world. Two salient network gatekeeping mechanisms have emerged: the censorship mechanisms in Baidu Baike and internationalisation/localisation mechanisms in Chinese Wikipedia. The findings show a contrast between the two interaction patterns, indicating mainland-centric versus transnational Chinese gatekeeping processes employing different kinds of collaborative filtering and different levels of user autonomy. KEYWORDS: network gatekeeping, Chinese cultural sphere, online encyclopaedias, Internet politics, Internet censorship. ABSTRACT: This paper compares the current Chinese mortgage market with the markets in several advanced economies that suffered most in the 2008 Global Financial Crisis, exploring the potential and rigidities of development of the secondary mortgage market in China. It finds that, first of all, while the over-securitisation of mortgages in the United States accounted for most for its housing decline and subsequent economic stress, the housing downturn in China is largely the result of the underdeveloped housing finance sector. Second, in the absence of a well-functioning legal system and mature primary mortgage market, China needs to make more effort to improve the diversity of the primary market before establishing a secondary market. Third, in China’s market transition, the nature of housing should be seen as neither an economic engine, as now in China, nor as a financial derivative, as in the United States. KEYWORDS: housing, finance, mortgage market, GFC, China.